New Telescope To Make 10-Year Time Lapse Of Sky It will produce what astronomers clamor for: a detailed map of every square inch of the night sky. Every 10 years, about two dozen of this country's top astronomers and astrophysicists get together under the auspices of the National Research Council and make a wish list. The list has on it the new telescopes these astronomers would most like to see built. At the last gathering, they said, in essence, "We most want the Large Synoptic Survey Telescope." Here's why. A synoptic survey is a comprehensive map of every square inch of the night sky. The Large Synoptic Survey — LSST — will do that multiple times. "We want to scan the entire sky over and over again for 10 years," says Sidney Wolff, president of the LSST Corp., who is in charge of building the new telescope. "And we will get over 800 images of every patch of the sky." Why would you want 800 pictures of the sky over 10 years? Well, it's like taking a time lapse picture of the sky. Anything that moves or changes will be easy to see. "So one of the things we can do is, if there are any potentially hazardous asteroids out there that might impact the Earth and do significant damage, we will find them," she says. The new telescope will also easily pick up the light from any stars that explode overnight and become supernovas. There's stuff between us and distant objects called dark matter. As the name suggests, dark matter doesn't give off light. Astronomers are pretty sure it's there; they just don't know what it's made of. To study dark matter, Wolff says, the new telescope can look for changes in the shape of distant objects, changes caused by the invisible dark matter. "It doesn't matter whether that matter emits light or not," she says, "because we're measuring its gravitational effect, and dark matter produces gravitational effect." 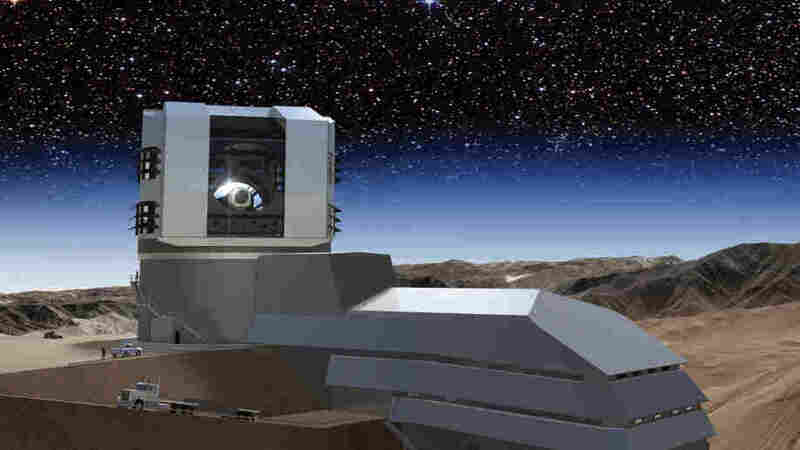 The telescope will ultimately be built on a mountain in Chile. But two of the telescope's main mirrors are being built at the Steward Observatory Mirror Lab on the University of Arizona campus in Tucson. In an odd but delightful juxtaposition, the lab is located under the university's football stadium. The two mirrors are actually made from a single piece of glass 27 feet across. The primary mirror, the first one the light will hit when it enters the telescope, consists of the outer ring of the glass. The light is directed to a second mirror that will be located above the primary mirror, and is to reflect down to the tertiary mirror. That mirror consists of the circle of glass inside the ring of the primary mirror. It sends the light to a detector, which is also above the main mirror. William Gressler is senior optical engineer for the LSST, as it is known. He says making mirrors for a survey telescope poses some special problems. Once the mirror is mounted in the telescope, it has to be swiveled rapidly across the night sky. "We can't take forever moving to the next part of the sky," says Gressler. "So we actually move very quickly. Within five seconds, we can move from one piece of sky 3 1/2 degrees over and get ready for another exposure." Gressler says they have achieved that agility with some innovative mounting hardware that will take stress off the mirror as it moves. 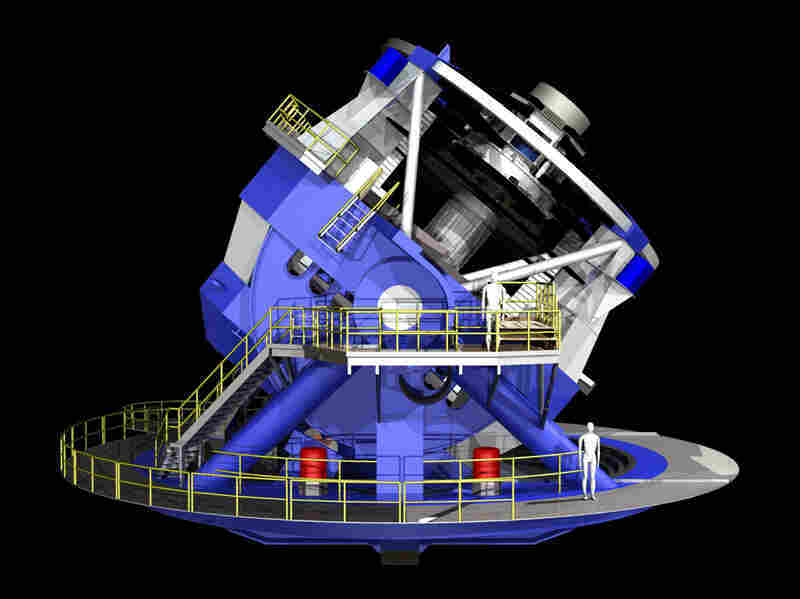 The telescope's unique, compact design allows it to swivel very quickly to different parts of the sky. This gives astronomers the ability to capture images quickly. Martha Haynes of Cornell University co-chaired the committee of astronomers that made the LSST top choice for the next big telescope. She says it beat the competition because a detailed map of the entire sky is useful for nearly every astronomer. "The surveys that are being proposed for the LSST will provide the data sets a vast variety of astronomers will use to answer fundamentally different questions about the universe," says Haynes. Right now all that's holding up the LSST is money. The mirrors were built with private donations. Bill Gates contributed $10 million, and the Charles Simonyi Fund for Arts and Sciences kicked in $20 million. The National Science Foundation and the Department of Energy are planning to put up the bulk of the rest of the estimated $400 million cost of the project. But the federal money needed to finish the project isn't expected to start flowing until the 2014 fiscal year.